Block printing is believed to have originated in China towards early 3rd century. Records of its presence in Egypt and some Asian countries were also found around the 4th century, from where it spread to Europe and other places. Apart from wood, blocks were made of metals and porcelain also. But wooden block remains the most sought after apart from metal ones which has gained popularity in recent times. 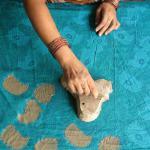 In hand block printing, the design is first drawn on wood using a sharp needle and then the desired design is carved using the chisel, hammer, file, nails etc. The printing involves laying the cloth/fabric, which is to be printed, on flat tables and impressions are made using the beautifully carved blocks. In case of direct printing, the block is dipped in the colored dye and impressions are made. In case of resist dyeing, impression of an impermeable material (clay, resin, wax etc) is made on the fabric which is then dyed in the desired shade. The block image remains un printed and reappears in reverse. Traditionally natural and vegetable sources were used for dyes. But with the advent of synthetic dyes, things have changed, not necessarily for good. The ease of usage and the availability of synthetic dyes have replaced the vegetable dye in many cases. The local phulkari embroidery has inspired bold floral and geometrical designs, found on wraps and stoles. Due to commercial reasons, however, the focus has shifted to screen printing.